Figured I might as well try to start doing some game reports. Last night Sylvain and I played a fighting withdrawal with Fallschirmjäger defending (Curtis) and Cossacks (Sylvain) attacking. I apologize if some of the picture aren't that great. I'm still playing around with flash or no flash. More on that later I suppose. 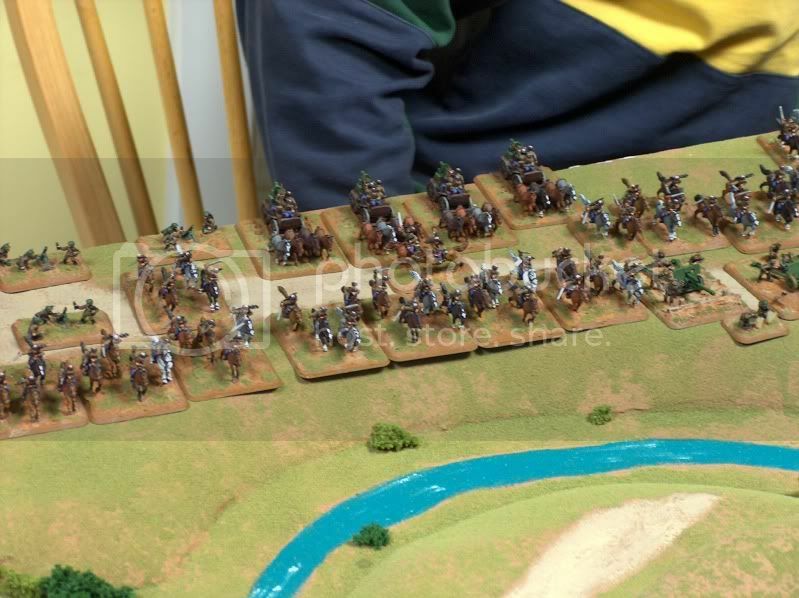 Anyway, to start there were so many cossacks Sylvain could barley fit them all on the board. Definatly cause for increasing the offical board size in FoW with the new intelligence books. You get way more for point costs now. and the Russians always got a lot before. I believe he had to leave the trucks off the board for his Anti-tank guns because they just wouldn't fit. Good thing for me! My Fallschirmjäger look pretty bare over there in comparison. And their numbers would start to get smaller each turn. This was a very strange but fun scenario. Maybe the coolest one. But I think we would need to play it a bunch and adjust tactics. Its also a good fast one because its not to the death. 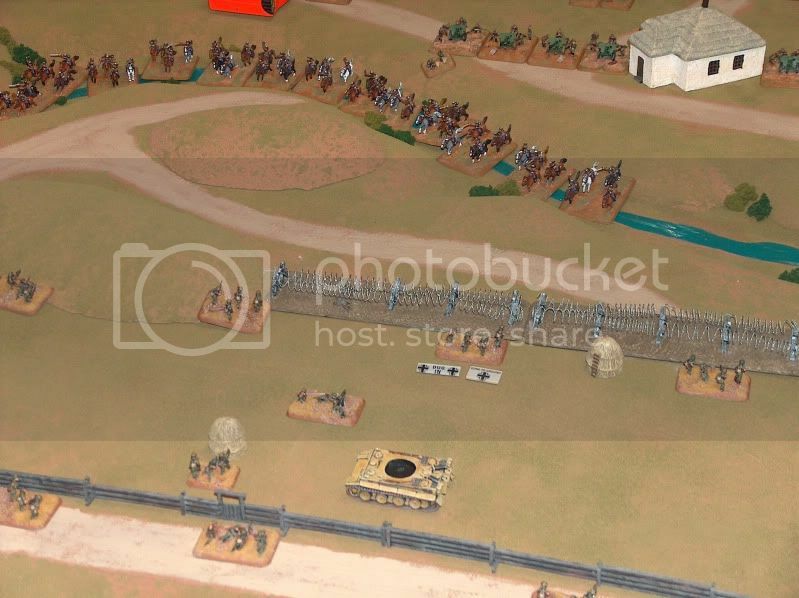 Basically the defenders will start loosing platoons on turn 3 as they start to withdraw. 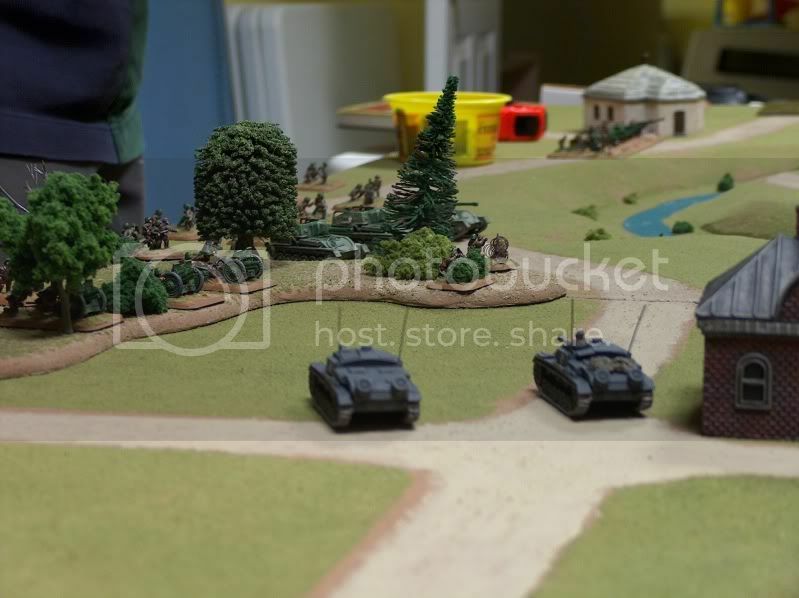 But the Trick is on turn 6 the germans get to start removing objectives. On turn 7 you remove a 2nd object leaving only 1. And if the Attacker hasn't taken an object by turn 8, the defenders win. Turn 1 not to much happened. 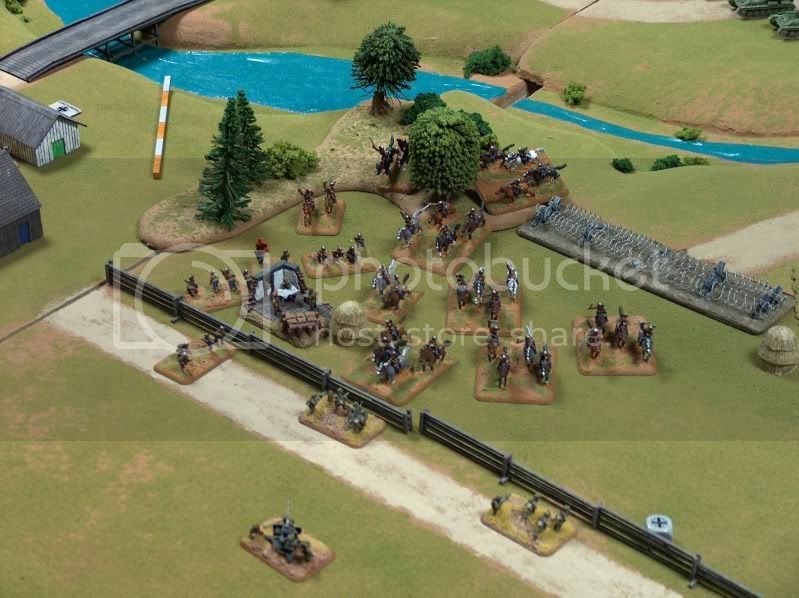 The Cossacks all charged into the ravine to prepare their assault the Fallschirmjäger defenses. 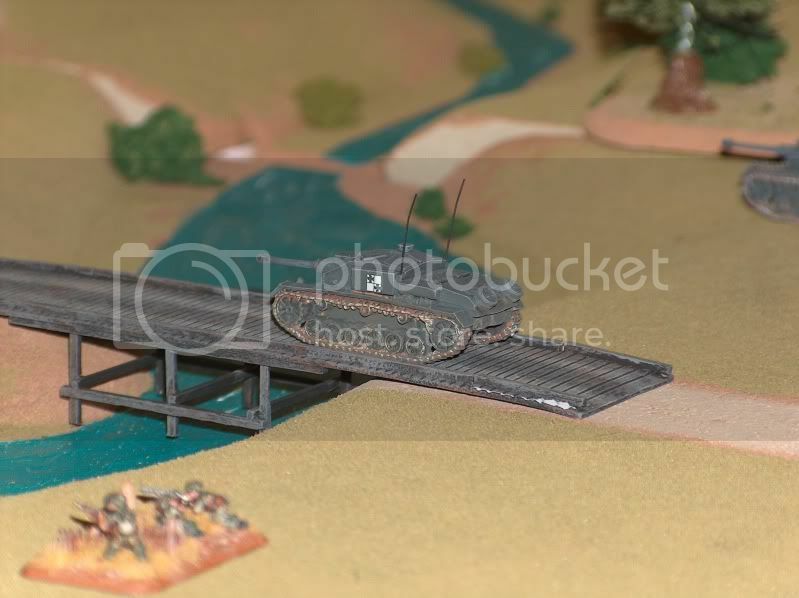 But 2 German StuG F/8's raced across the bridge to start harassing the german flank. Turn 2 turned out to be the decisive turn. The German mortars pinned the Cossacks in the ravine, and they failed to become unpinned. Something to be said about Kommisars hey Sylvain? Which he had none this game. This delay prooved to be fatal in the end. 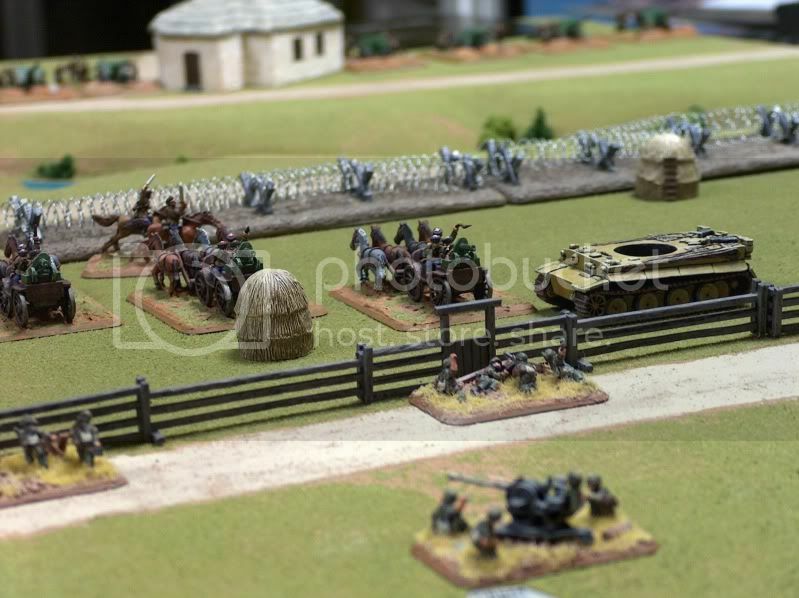 Turn 3 was more of the same, Cossacks stuck in the ravine while the StuG's continued to beat upon rear units. Except this time 1 platoon was to leave the field of battle. The Fallschirmjäger decided to pull their front line combat platoon away from the barbed wire, leaving the door open. Soviet Sturmoviks tried to take on the StuG's but there were just to many Soviet Troops, and the StuG's got near them too quickly. So the aircraft were waived off. Sylvain, seemed to think the Russians would be OK with their own troops getting in the way. "We shoot our own troops all the time, why should aircraft be any different". But I suppose Russian pilots or more sympathetic then Kommisars. Turn 4 the Cossacks finally broke out of the ravine, and put them selves into position to launch an assault against dug in Fallschirmjäger. The Fallschirmjäger continued their withdrawal and pulled out the mortars this time. Turn 5 the Cossacks moved into position to take an objective and dismounted. Mean while devastating bombardments continued to rain down. but the guns were just not big enough to destroy the dug in paratroopers. 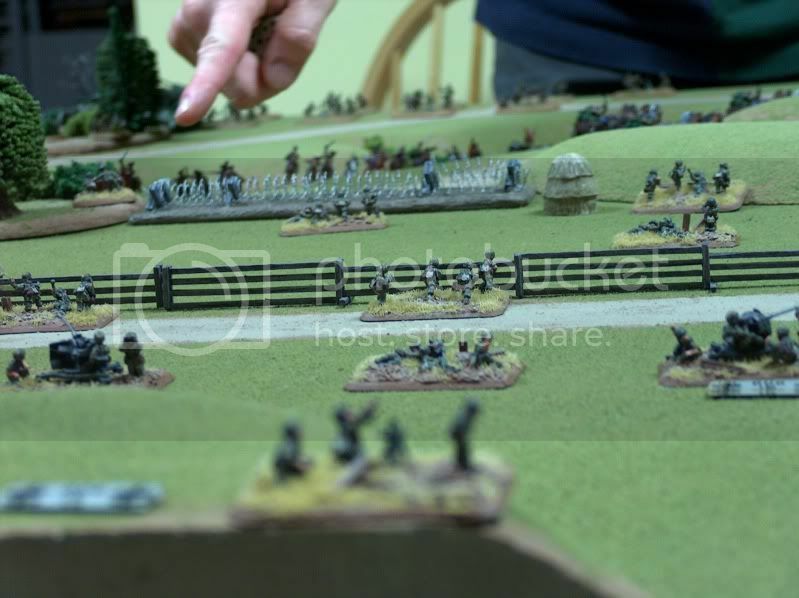 The Germans would continue to hold on, keeping their heads down and not attacking. The StuG's completely obliterated the Soviet Heavy mortars, and moved on to destroy more cossacks in the ravine, and they were getting dangerously close to the front lines. But this time there would be no withdrawing a platoon for the entrenched Fallschirmjäger. Turn 6 would see the removal of the first objective. Freeing up the Fallschirmjäger Pioneers to attack. 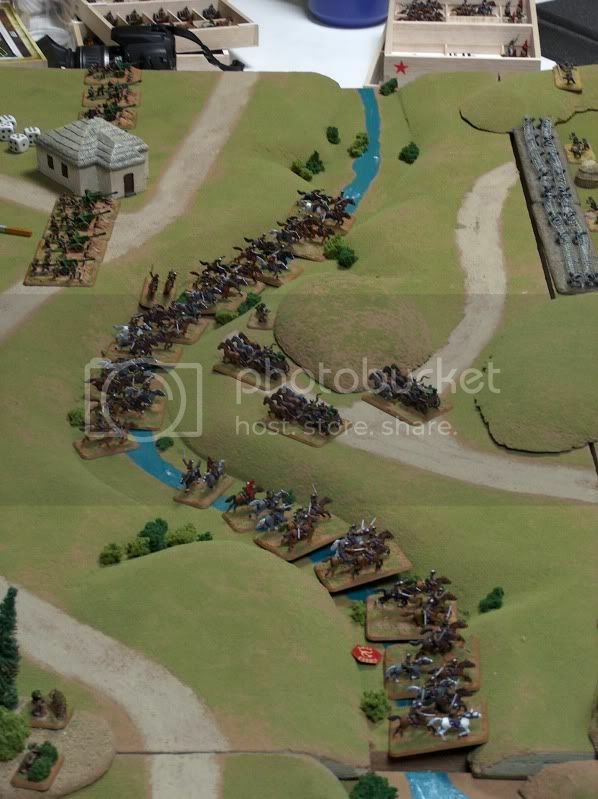 Realizing, they were running out of time, the Cossacks made a charge for the 2nd line of defenses. 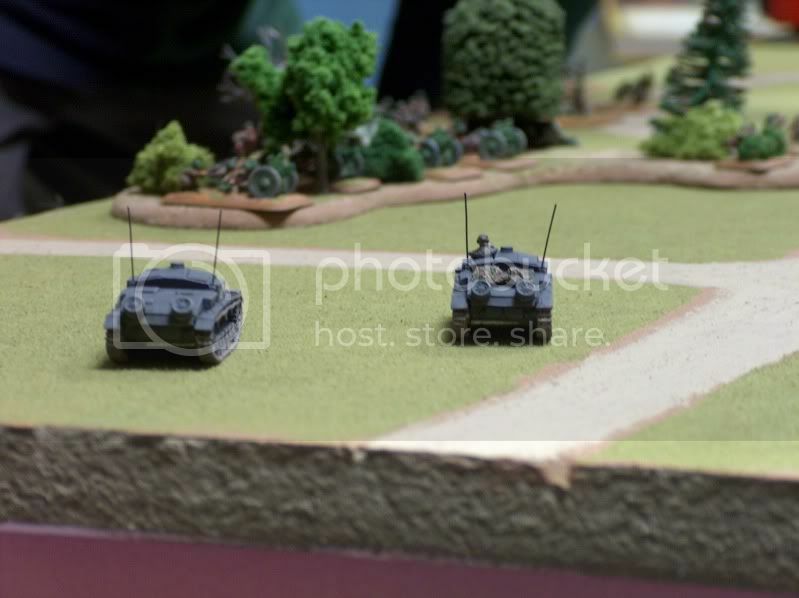 Unfortunately for them German HMG's mowed them down and beat back the assault. Feeling that they did enough damage, the Germans withdrew the StuG's. This broke the cossacks back. 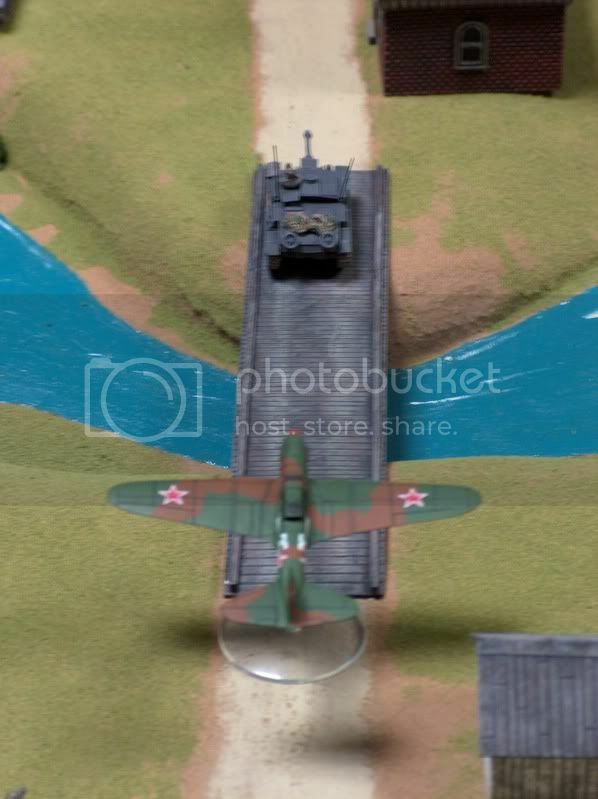 the 2nd objective was removed, and they made 1 last ditch effort for the 3rd objective, but it was to late. The Fallschirmjäger successfully delayed the Cossack charge long enough for their armies to escape. This was a very fun scenario. But seeing how history and this article was written by the victor, I'm not sure Sylvain feels the same. I would defiantly like to try this one several more times. I think understanding the scenario a little better the out come might be a bit different. I think my next article is going to be about my purposed rule changes to the fire arc. My only pet peve for this game is the lack of usefullness of the turrets. I know they want to keep things simple, but I'd don't care about simple when you have these beautiful figs to play with. If you want simple play A&A minis'....that game is awful....sorry Matt. here are the rest of the pics from our battle. 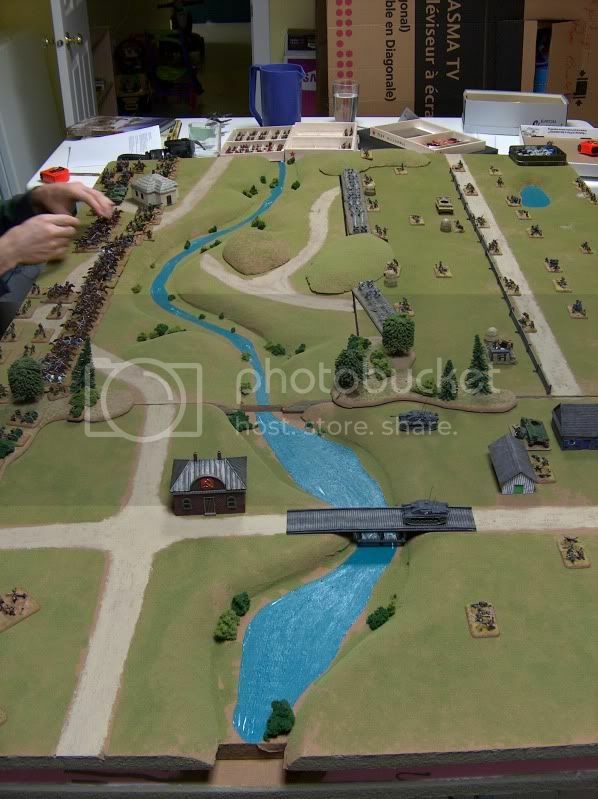 Not only is this a great battle report (with lots of "quotes"), the pictures are also pretty cool. 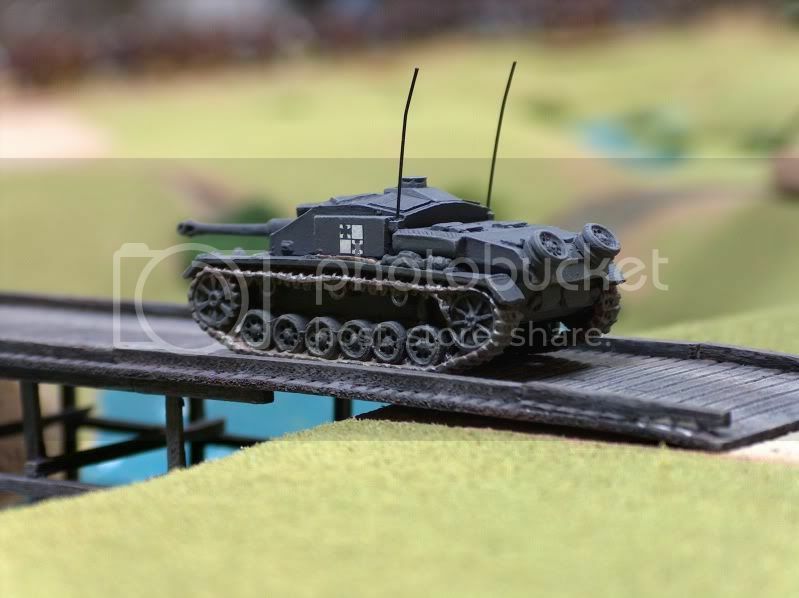 I especially like the one with your StuG on the bridge. Great job!